It is never easy when it comes to purchasing that one bike that will suit your riding needs all together. This is particularly because of the several brands that are out there in the sports world. 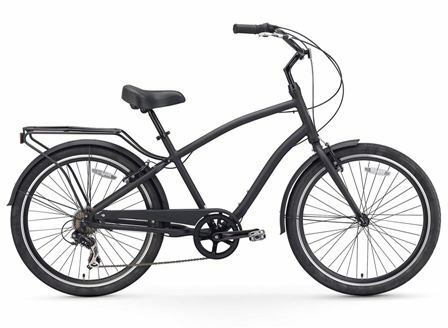 For that reason, we bring you the sixthreezeroEVRYjourney Men's Hybrid Cruiser Bicycle, which is one of the most preferred bikes among serious cruisers. To begin with, the bike is classically designed and has that attractive look that will have all eyes on you as you cruise around the neighborhood. Secondly, the bike is sturdily built to make the rider capable of riding on the hillside comfortably while enjoying optimal stability. Another exciting thing about the bike is that if you don’t want to task yourself with the assembly process after purchase, the manufacturer gets to do it for you and will only cost you a few dimes. Discussed below are the outstanding features of this Evryjournery men’s hybrid bicycle. The gear capability of your bike determines how much vastness you will enjoy on your biking trips. This Sixthreezero bicycle comes with 1,3,7 and 21 speed gears that allow you to ride through varying biking trails without much trouble. Whether you need to go off road or uphill, these gears provide all the tenacity you need to handle such trails. Additionally you don’t have to worry about the quality of the gears since they are from Shimano, which is a trusted gear company. A bike with a frame that’s lightweight is usually much easier to handle than one that’s designed with a heavy one. This bike is designed with an aluminum frame that’s a great addition to its lightweight feature. The aluminum frame also makes it sturdy, which comes as an assurance for longevity even when exposed to tough biking conditions. Besides, this sturdy frame gives the bike the capability of holding up to 300 lbs and thankfully the weight of most grownups. Another thing is that the lightweight nature of the frame allows the rider to maneuver through complex biking trails without losing balance. The frame is 19-inch long making the bike suitable for the average heights of most individuals ranging from 4 inches and 5 to 6 feet. Every other day while on your riding rips you definitely have to come across emergency situations like finding a young one playing on the road or head on collision instances with an oncoming vehicle appearing out of nowhere. Well, with a poor break system fatal accidents are likely to occur when you face such emergencies. For an assurance of safety in such instances, this bike is designed with quality front and rear handbrakes. This brake system has the ability to bring the bike into a quick smooth halt that won’t leave you jolted up alongside the road. Moreover, one thing that you should always do as an enthusiastic rider is to ensure that your brake system is perfectly fine before you get on your ride. Maybe you have purchased a bike before and you had to have the seat replaced because of an unbearable discomfort. This is never a pleasant experience especially when you have in mind that no one does the replacement free of charge. Well, this Evryjourney bike seat is richly padded with thick foam to provide the user with all the comfort they need for smooth rides. To begin with, the thick foam padding provided ensures that the rider never gets to feel bumpy effects while on off road riding. Besides, the seat is made with synthetic leather which makes it remarkably resistant to wear and tear. 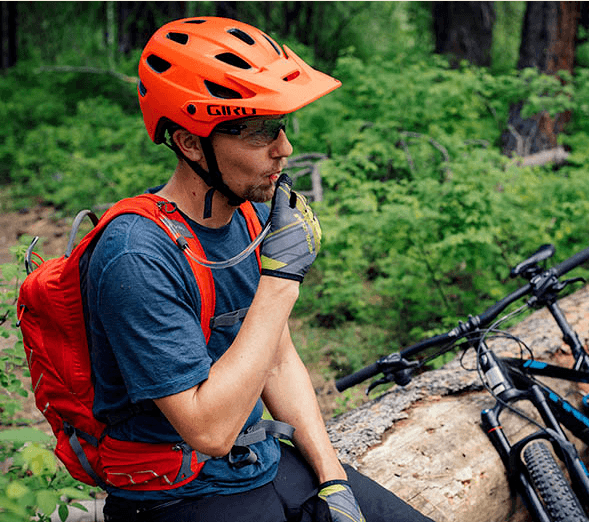 Do you need a bike that you can carry along while going for long camping trips with friends or family? This bike will be a great option for you. This is thanks to the front wheel that can be removed for convenient transportation when you need to carry the bike in the boot of your car. This way you will not have any trouble tagging your cruising bike on your leisure or camping trips. Additionally, if you have limited space in your home this feature can be used to detach the front wheel so as to make it consume less space when not in use. This feature also enhances the bikes safety especially if you usually leave the bike at some parking space while getting into the office. Ever rode on a bike that leaves you toppling down anytime you ride on a rough road or when you are caught up with wet weather on your trips? Well, this Sixthreezero EVRYjourney Men's Hybrid Cruiser is not of that kind. It comes with 2 inch wheels that provide sufficient traction on all kinds of roads. With this you don’t have to be worried about slippery roads every moment you get caught up with showers while biking. Furthermore, the thick tires also give you room to control your speeds conveniently without losing stability. With the rear rack the bike allows you to tag along additional baskets to carry all that you may need while biking. The bike’s frame is made of aluminum thus making it quite durable as well as lightweight for easy maneuvering. You can always have emergency stops with the high quality front and rear brakes featured. The thick tires provided allow you to cruise in all kind of terrain without losing stability and speed. The bike is suitable for riders with the average height of 5 to 6 feet and 4 inches as well. If you wouldn’t like to dirty yourself with assembling the bike, you can have Sixthreezero do it for you at a fee. You will not need to incur any expenditure on purchasing another seat since the one provided is pretty comfortable. Most users experience problems while trying to adjust the brake system. It is assembled halfway so the rest of the set up process is given to you and that could only be avoided by paying some extra cash to the manufacturer for complete assembling. Question: I am interested in this bike but I did notice that it has a weight limit of 300lbs but I am a little heavier with 320lbs weight. Will it be suitable for me? 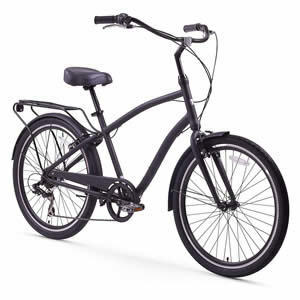 Answers: Most of the time these cruise bikes can hold more that their limit and this is derived from reviews where individuals weighing up to 350lbs have been able to use the bike comfortably. Question: I want to buy this bike as a birthday present for my husband who is five feet tall. Can it accommodate him? Answer: Yes, he is within the height limit that’s recommended. Question: Does the bike come with both the front and rear fenders? Finding a bike that’s richly featured to meet every rider’s biking dreams is not quite easy. 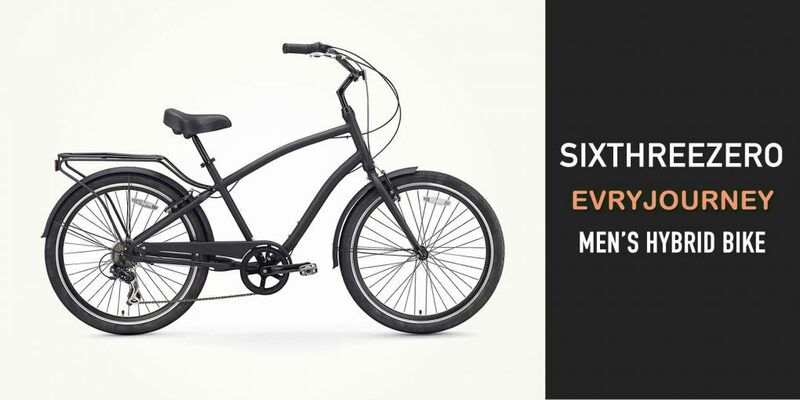 However, you are now convinced that Evryjounery makes it possible for you with the sixthreezeroEVRYjourney Men's Hybrid Cruiser Bicycle review given here. Whether you have been in search of a cruise bike for group riding or cruising through your neighborhood, this bike is all you need. Regardless of the brakes having an adjustment issue, this bike’s overall performance is top notch. If you are now convinced that this is your type of bike; all you need to do is place an order from your favorite shopping store.